Outfitting the kelp farm has always been a large part of the process, but one that would be addressed after all the permitting was complete, and that process took over a year, so we didn't worry too much about the gear. It was a distant item on our to-do list. Then, without warning (*with plenty of warning from Greenwave which we failed to heed) it was time to get all the gear ready for the farm. I am sure that with the right funds, a person could go to a store or two and purchase these items and be done with it, however that is not how Jay and I roll (mostly because we do not have the right funds). The buoys and most of the line needed to be purchased so they would meet regulations. Greenwave had some line they were sharing with all the farmers. The anchors, however, were something that we could build...and build them we did. I thought the process was so interesting and so time consuming that I felt compelled to honor it with a post. Our anchors are disappointingly concrete. I hoped for something more iconic - something that would be tattooed on a forearm or a bicep - but that was not in the cards. What i did appreciate, however, was the DIY-ness of the anchors. We borrowed the design for a form from Bren. The form makes a standard pyramid anchor - essentially an inverted pyramid resting in a wooden frame. The plan was to fill the form with concrete, allow it to set up, lift the anchor out, rinse, repeat. The form was designed to make concrete anchors that weigh approximately 160 lbs which was necessary for us to meet the permitting requirements. Figuring out how to actually make the anchors, fix the links of chain into the anchors so they could be attached to line, and try to reduce the friction was left to Jay and I to noodle on. Jay was the project manager on this one - and there was some trial and error - but I think he landed on a pretty good process for making the 36 anchors being used to hold our farm in place. We used 3 forms built from plywood. Jay painted fiberglass on the inside of the forms to keep the concrete from setting to the wooden form. We learned (after a few anchors got stuck) that if we covered the inside of the form in wet newspaper before filling them, the anchors easily slide out of the form after they set. We purchased process from a stone yard, we purchased long metal chain from a salvage yard, we had a winch, and we borrowed a metal cutting saw. We set the forms up in a row under a ladder. Suspended partially in the form was a chain which would be used to tie the line to. We crisscrossed 4" pieces of rebar to secure the chain in the anchor and give the concrete more metal to grip. We didn't want the chain to break out of the anchor. Here is a picture since this is hard to describe. Our anchor recipe was two parts process, one part sand, one part water, one part elbow grease. We mixed the anchors in our wheel barrow and shoveled the concrete into forms. Each anchor took 24-48 hours to set. I learned, while waiting for the anchors to harden, that concrete becomes hard through a process called hydration which is a chemical reaction where the major compounds in cement form chemical bonds with water molecules. We used a winch to lift the anchors out of the forms. Once lifted, the form needs a little encouragement (we tapped them with a 2X4) and then the anchors need to rest for a few days. We had to give them time to adjust to their new state. If you were to watch the blooper reel, you would see Jay hurting his back from lifting too many anchors solo, you would see me scraping all the skin off my knuckles when an anchor attacked me while I was moving it, you would see Jay cutting lots of metal chain WAY too close to our flammable home and other painful/stupid mistakes. You would also hear lots of four letter words that my toddler is now repeating. Who knew that making anchors would be such a large part of establishing an ocean farm? Jay and I have had a lot of questions around the kelp farm and thought it would be a valuable exercise to go through them and try and come up with answers that are acceptable for now and as we learn more, we can update them. Kelp, specifically sugar kelp which is what we are growing, is algae. It's seaweed that you would find washed up on local beaches. The sugar kelp we are growing is a winter crop. We seed in the late fall and we harvest the kelp in the late spring. Kelp grows SUPER fast (between 1 and 4 centimeters a day - an inch is 2.54 cms for us 'mericans) and is used many ways worldwide. What on earth possessed you to grow kelp? Its no secret that both Jay and I love and rely on the ocean for a living. We own a marina, we live directly on a river that leads to the little Narraganset bay, and we put food on the table using money earned through rentals and bait sales which only happen because the waters here are clean and have healthy fisheries. Our home, income, and everyday lives involve our local watershed. Kelp farming is a way to help clean up some of the nitrogen that is being pumped into our rivers and oceans from human activity. Kelp farming has very little impact on the natural ecosystems (the kelp absorbs the nitrogen and provides a nice habitat for little fishies while requiring no fertilizer, no fresh water, only sunshine and ocean). We also are supporting a cool economy and hopefully can offer new jobs one day to farmers that we hire to help us out. It just seems to make sense. It checks all the boxes - involves water, is good for the environment, allows jay to spend lots of time on the boat, is a winter crop so won't conflict with marina demands, can be done locally...i could go on...we apparently have a lot of boxes to check... The FAQ should really be "Why haven't we done this sooner?". How does the farm work (and do you have to own the ocean)? No mom, we didn't buy a part of the ocean. Actually, this is a question we got a lot. We did have to lease an area located in state waters which is designated as a site appropriate for aquaculture (think oysters, mussels and stuff like that). The farm is all underwater. Kelp is a sea vegetable, but a really important difference between sea vegetables and land vegetables is kelp doesn't use its roots to adsorb nutrients from soil like spinach or kale. Because of this, kelp's "roots" (they are really called the holdfast which is pretty straight forward) are just used to attach the kelp to something underwater where the kelp can grow and absorb nutrition from the sun and the passing water. In nature, kelp can grow from the bottom of the ocean up (sort of like grass), off the side of a rock, or in our case, from a line downwards (sort of like the branches of a weeping willow). The kelp seed comes from a hatchery and is handed over to us in a spool - more specifically a spool of kite string. The actual farm is all underwater (with a few buoys on the water surface to make sure things don't sink to ocean floor). It looks a little like this low-rent post-it drawing featured above. The spooled kelpy-kite string is unrolled around a horizontal line about 5 feet below the surface of the water. Imagine a balloon on a long string tied to a rock - now imagine another one about 200 feet away. We tie the kelp seed line to each of those anchored balloons (buoys) and let it sit in the ocean - it can't sink and it wont float away because of the anchors (we hope!). It grows downward allowing us to harvest it easier. We can also check on it without diving in the ocean in the middle of winter. Where are you getting the kelp seed? 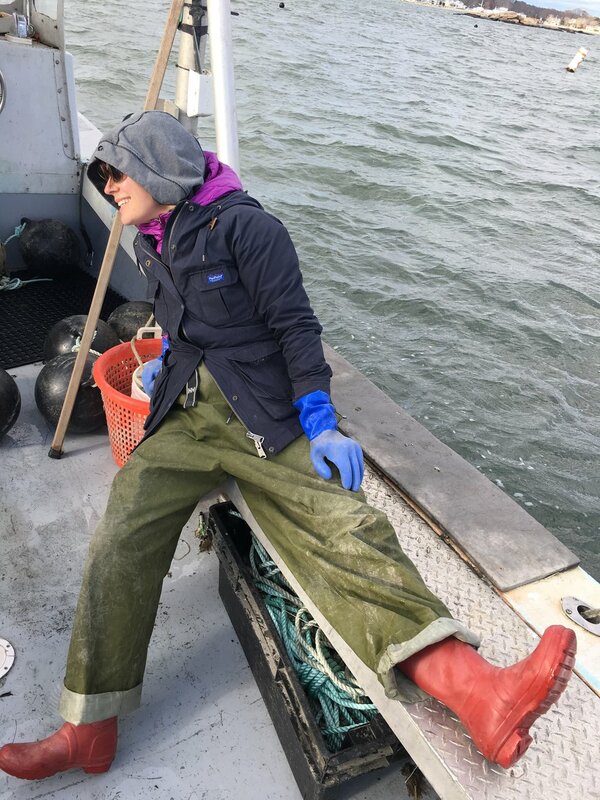 UConn and the Connecticut Sea Grant have been looking at kelp and ways to germinate and cultivate the plants. They have partnered with Bren at Greenwave (the glorious NGO we are working with) to get the right type of seed to the farmers. Divers go out in the early fall and harvest seed from wild kelp forests that are growing locally. They collect sorus tissue which has the spores for future generations of kelp and bring it back to UConn. The seed comes to us in spools of "seed-line" and all we need to do is string it out in the ocean and pray it works. Would Jay and I actually eat it? OF COURSE we will...so will our cruddy kids and so will everyone who comes to our house. We will also drink it (stand by for more on that). It can be really good for you. How do you get it once it grows? Nothing we are doing here is high tech. The harvesting is fairly simple - you go to the kelp farm, use your hands or a winch from the boat to lift the heavy (hopefully) kelp line from the water and you cut the kelp off with scissors. You then place it in a bin and rush it back to the processing plant. Kelp needs to be processed right away to keep it usable. This is a race against the clock. Once it is at the plant, it is cleaned, blanched, and frozen in under 24 hours. Jay and I will be a part of this process. What do you use kelp for? / Who is going to buy our kelp? Greenwave has helped us navigate the process from seeding to selling. They have worked with for profit organizations such as Sea Greens to establish market demand for kelp and explore new avenues of application - for instance kelp can be used as fertilizer, as fuel, in cosmetics, and as food for humans and animals. Jay and I are the farmers who sell to value-added businesses like Sea Greens. They take the kelp and turn it into what the market wants. Jay and I, obviously, will retain some of the product to mess around with and to share with you good people. I hope to offer kelp to local restaurants directly as well as bring to CSAs or farmers markets. Why not, right?